© Reynders-Frederix et al. ; Licensee Bentham Open. 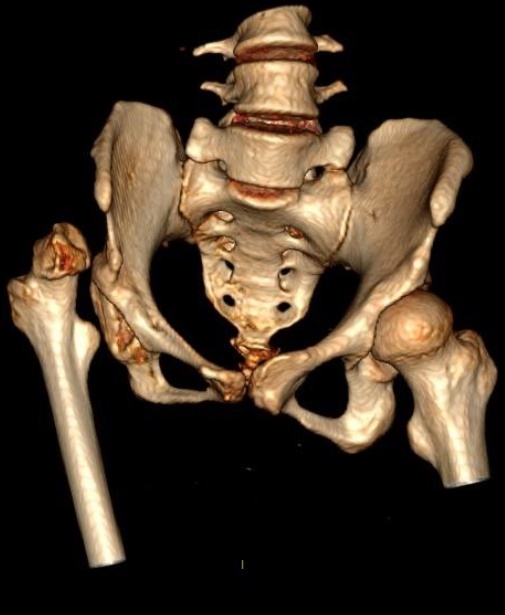 Young patients with a acquired dislocation of the hip with concomitant shortening of the lower limb is a difficult diagnostic problem with few definite treatment options. We used the technique, originally described by Ilizarov, with a double femur osteotomy and lengthening the femur. Lengthening was done with a sub muscular placed on-lay femur distraction rod. Distraction of the rod was done by fluid mechanics. After lengthening, the distraction was secured by a parked plate by locking the distal part of the plate. This patient needed a lengthening of 60 mm, distraction time was 36 days with a distraction index of 1.61 mm per day and a healing index of 31.4 days per cm lengthening.We encountered one complication in which an exchange of the plastic feeding tube was needed at 20 days post-surgery. In the reported case we could improve gait with reduced limping and equalizing her leg length discrepancy. Keywords: Bone lengthening, Congenital hip dislocation, Hydraulics Ilizarov technique, Lengthening nails, Pelvic osteotomies. The first description of the “Pelvic Support Osteotomy” comes from Lance 1936. He described a sub trochanteric femur osteotomy in the surgical treatment of chronically dislocated hips. Ilizarov proposed additionally a varus osteotomy of the distal femur. This allowed a strong abduction osteotomy of the hip and thus less Trendelenburg gait. By including this varus osteotomy of the distal femur, parallelism of the legs was restored. With his external circular frame Ilizarov also added a lengthening procedure of the femur by to distraction-osteogenesis. Drawbacks of this treatment were the specific complications due this unique external fixation mode. Also, patients had to spent on average 7 months in an external circular fixation frame. In our case the lengthening procedure was done by a lengthening nail attached to the lateral side of the femur. Permission of the local institutional review board was obtained to publish this case. A twenty-two old African women had a longstanding neglected dislocation of her right hip. The other hip was dysplastic without dislocation (Figs. 1a and 1b) . According to her mother there was no history for a neonatal septic arthritis of her hip joint. The infirmity of this patient developed gradually from the third year after her birth. Initial radiograph, depicting the dislocated positioning of the femur head and dysplastic acetabulum socket. The muscle function of the hip abductors proved to be rather poor. Clinically no active abduction of the hip was possible. No active extension nor flexion of her knee was possible. She had only a slight (15°) extension possibility of her ankle and toes. Her ankle and foot was fixed in a equinus position of 20° which was only partially reversible with passive stretching. 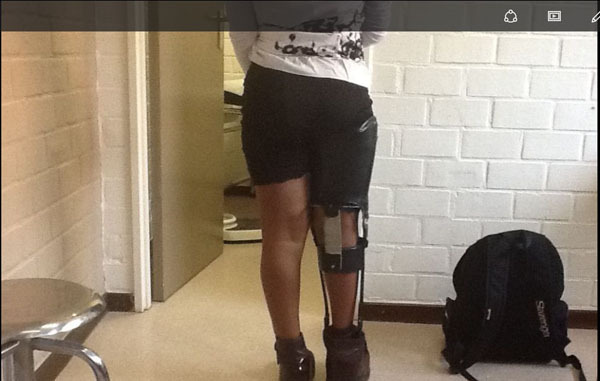 She walked with a heavy caliper splint to block her knee while walking, as shown in Fig. (4). A shoe elevator was fixed to this orthosis to compensate for her leg length discrepancy of 6 cm. She was complaining of a painful lurch on walking. The extreme shortening of her right leg caused an instability of her left leg. She held her left knee bended with her left hip in abduction in an effort to compensate for her leg length discrepancy. Also, her right hemi-pelvis was elevated, probably because of contracture of her left hip abductors. Radiographs and 3D-CT showed a complete dislocated right hip with aplastic acetabulum and loss of sphericity of the femoral head. The other hip joint was severe dysplastic. as shown in Fig. (1b). 3D CT reconstruction of the initial situation of the pelvis. When consent was obtained from the patient a valgus osteotomy of the proximal femur was obtained by the drilling and chisel technique. 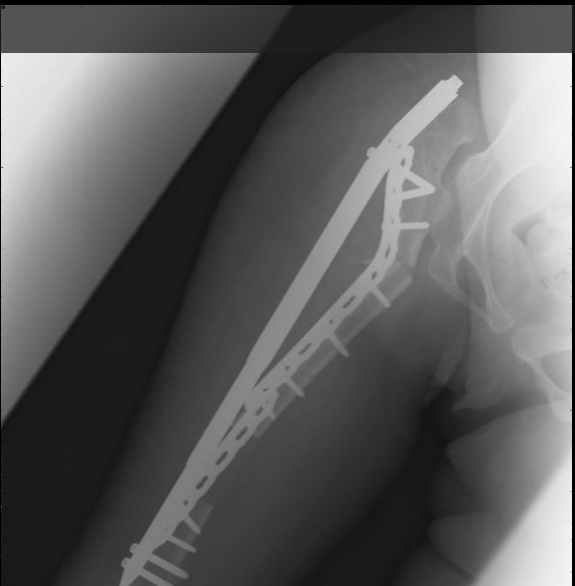 This osteotomy was fixed with a conventional plate in 135° of valgus. The distal osteotomy, 15 cm proximal from the joint line was done by the same technique. Both osteotomy sides were spanned with a hydraulic lengthening nail  (SwiBe®, Trigona AG, Lengnau Switserland). Lengthening of the nail is produced by daily injecting a liquid through the flexible external feeding tube into the master pressure room within the nail which presses a plunger down, technical details of the hydraulic nail were described in 2015 . Because of the small diameter of the femur and the crooked position of the proximal part of the femur a normal intramedullary placement of the nail was not possible. The nail was fixed with one 5 mm locked screw (Synthes-DePuy, Belgium) at the proximal part and two 5 mm locked screws at the distal part. To increase the stability of the distal femoral osteotomy a large 4.5 mm eight hole LCP (Synthes-DePuy, Belgium) plate was positioned as a bridge at the anterior surface of the distal femur. Only the distal part of the plate was fixed by three 5 mm LCP screws. The proximal part of the plate functioned as a glide plate which kept the distal part of the intermediated bone segment in alignment with the distal femoral part Figs. (2a-2c). Radiography after the two osteotomies of the femur. The distal femur plate is not attached with screws. Lenghtening rod attached to the side of the femur. Radiography after removal of the distraction rod with securing the distraction site with a plate. This patient needed a lengthening of 60 mm, distraction time was 36 days with a distraction index of 1.61 mm per day and a healing index of 31.4 days per cm lengthening. Radiography after valgus osteotomy of the proximal femur, positioning the lesser trochanter into the acetabular socket and increasing the abductor leverage arm. We encountered one complication in which an exchange of the plastic feeding tube was needed at 20 days post-surgery. At 36th day after initial surgery, the plastic tube was cut flush with the nail tip and the distally parked plate was fixed with additional three LCP 5 mm screws to secure the lengthening. In the same surgery, the lengthening nail was removed. Bone healing was uneventful. One year after surgery she fell and broke her patella, which needed a cerclage. At her last follow up, two years after surgery, her knee improved which made walking possible without caliper, as shown in Fig. (3). She then started wearing normal shoes and walked with one stick at her right side. She had no pain and her Trendelenburg lurch disappeared. Clinical end result, two years after surgery. Patient is in no need for a caliper nor shoe elevator. Clinical situation before surgery, showing the patient with the heavy, full leg, caliper and shoe elevator. Although the initial length was restored by the lengthening, the femur kept on migrating proximally until the lesser trochanter came in good contact with the acetabulum. As in Figs. (5a-5c). Showing cranial migration of the lesser trochanter in the acetabular socket. Global radiograph of the femur and hip joint two years after surgery. At one year post surgery, her SF 36 score was 82.2 % for the physical scale and 92.1 % for her mental wellbeing. Her LEFS (lower extremity function score) was 44/80. Eighty representing the maximum score. The Harris hip score increased from 42 pre-operative to 72 one year post-operative. Scoring was done by a medical doctor not involved in the surgical procedure. Hip instability due to a neglected hip dislocation is rarely seen in Western society, most cases are imported from Africa or the Middle-East. The etiological factors are neglected CDH , neonatal septic arthritis of the hip and extraction of total hip prosthesis due to antibiotherapy-resistant infection and poliomyelitis . The purpose of the treatment is to improve gait with minimal pain which doesn’t compromise activities. By equalizing the limb length deficiency the instability of the other limb is addressed. Total joint replacement of a chronically dislocated hip, although possible, is probably a demanding procedure with a high risk of failure ranging from 17 % to 32 % [4-7]. In our patient the high dislocation of the hip and the clinical paralysis of the hip abductors may increase the risk of prosthesis instability. Therefore, total hip prosthesis in our patient would not be indicated. A valuable alternative would be the Ilizarov type of hip reconstruction with the Ilizarov external circular frame, but with the prospect of eight months in an circular external fixation frame, the patient refused this treatment option. The external ring fixator as described by Ilizarov remains in most cases the gold standard. It used to be a less expensive fixation method. But recently, the increase of disposable material offered by the industry increased the cost ; a simple Ilizarov frame, four rings, can go up to 3000 €. Material which is only marginally reimbursed. The bulk of material of the circular frame may also limit functional capacity of the patient and decrease motion of the patient. Because of the multiple transfixing pins, pain and pin track infection are major issues [8, 9]. The proximal femur osteotomy lateralize and displaces the greater trochanter distally to increase the abductor power of the abductor muscles. The level of the proximal femoral osteotomy is critical. In full adduction of the femur, the level of the proximal femur lies at the projection of the ischial tuberosity. The amount of valgus given at this osteotomy should compensate this adduction with an overcorrection of 30°, to compensate for the additional adduction contracture of the hip, to allow for the restoration of the distance between the knee and the midline as projected from the middle of the pelvis downwards . This correction of the “abduction” of the femur is done by adding the distal femoral varus osteotomy. This osteotomy allows the restoration of parallelism of the two legs with an equal distance between the center of the both knees and the pelvis midline. Correction of the flexion contracture of the hip is essential to diminish the lumbar lordosis. When the arc of hip flexion is minimal (less than 90 °), care should be taken not to extend the proximal femur too much, this makes it difficult to put shoes in a sitting position. The third part of the surgery consists of lengthening the leg to correct the limb length discrepancy. With Ilizarov’s technique, the bone distraction is done with his Ilizarov frame. We proposed a lengthening rod, as described by Götz and Schellman in 1975 and Reynders and Dobre in 2015. The lengthening nail driven by hydraulics is brought in submuscular and attached to the external side of the femur with locking bolts. This distraction with the eccentric placed lengthening device acts more like an internal fixator. For obvious reasons, this device could not be brought inside the intramedullary cavity of her femur. 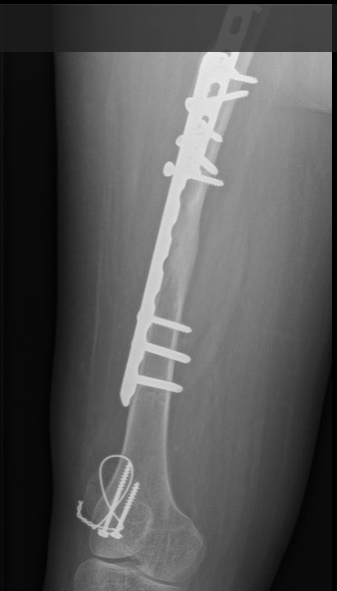 Krieg in 2010, described a case where the proximal femur osteotomy was combined with an intramedullary lengthening device which was applied in a retrograde manner. Although possible, this makes the procedure more difficult and minimize the possible varus correction of the distal femur. The lengthening system we used was fixed only with one screw proximally at the greater trochanter to allow some degrees of rotational freedom. 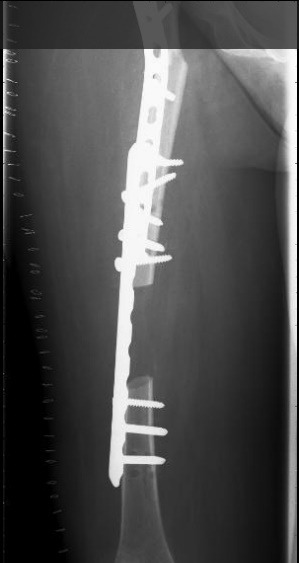 Two locking screws fixed the rod distally on the lateral side of the femur. In this way, the distraction was more in line with the mechanical axis avoiding medialization of the knee. The latter is often seen with intramedullary lengthening devices, when lengthening occurs according to the anatomical axis of the limb. A lengthening of 58.1 mm was obtained, time of distraction was 36 days with a distraction index of 1.61 mm per day and a healing index of 31.4 days per cm lengthening. This healing index corroborates with other authors [11-13]. Some overcorrection of the limb length discrepancy is necessary because after surgery the femur continues to migrate proximally until good contact is established between the lesser trochanter and the acetabular roof as in Fig. (5a) . After correction of the limb length discrepancy, the lengthening rod was removed. Distraction was preserved by proximally locking a 4.5 LCP plate. This plate was brought in at the initial surgery, but only locked distally. The plate functioned as a gliding plate, adding some stability at the distal distraction site. After two years of follow-up, we observed a better gait, less Trendelenburg lurch, with less lumbar lordosis and no need for a cumbersome full leg orthosis stabilizing the paralyzed knee joint. The authors described a case of acquired dislocation of the hip in a twenty-two years old female. 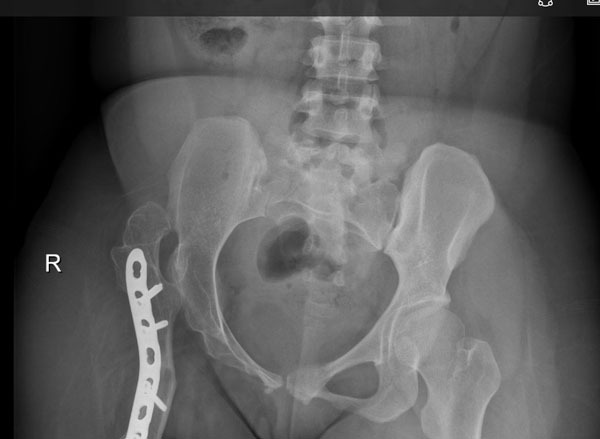 A pelvic support osteotomy was performed in combination with a sub muscular placed lengthening rod. Functional outcome was favorable in which the patient was liberated from her full leg caliper with special shoe to correct for her limb leg discrepancy. Over lengthening of the femur seems necessary to compensate for late migration of the lesser trochanter in the acetabulum. Reynders-Frederix Cristina; writing of the paper, literature search and contributed to the figures. Wajid Muhammad; writing of the paper, proof reading. The authors received no benefits in any form or will be received from a commercial party related directly or indirectly to the subject of this article. Reynders P, Dobre C. Intramedullary Nailing A comprehensive guide Limb Lengthening: hydraulically driven. Springer Verlag 2015; pp. 527-43. Kocaoḡlu M, Eralp L, Sen C, Dinçyürek H. The Ilizarov hip reconstruction osteotomy for hip dislocation: outcome after 4-7 years in 14 young patients. Acta Orthop Scand 2002; 73: 432-8. Harris WH. Traumatic arthritis of the hip after dislocation and acetabular fractures: treatment by mold arthroplasty. An end-result study using a new method of result evaluation. J Bone Joint Surg Am 1969; 51(4): 737-55. Hartofilakidis G, Stamos K, Karachalios T. Treatment of high dislocation of the hip in adults with total hip arthroplasty. Operative technique and long-term clinical results. J Bone Joint Surg Am 1998; 80(4): 510-7. MacKenzie JR, Kelley SS, Johnston RC. Total hip replacement for coxarthrosis secondary to congenital dysplasia and dislocation of the hip. Long-term results. J Bone Joint Surg Am 1996; 78(1): 55-61. Kim YH, Kim JS. 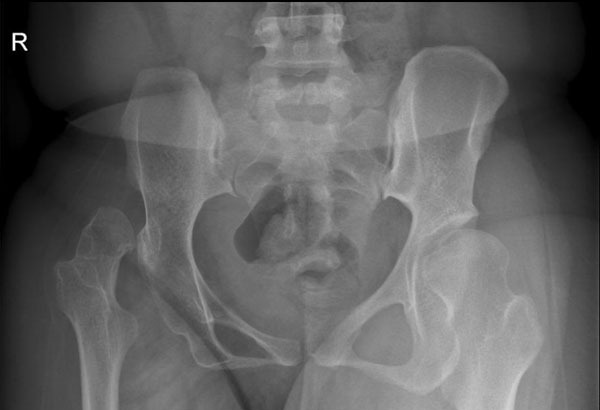 Total hip arthroplasty in adult patients who had developmental dysplasia of the hip. J Arthroplasty 2005; 20(8): 1029-36. Chen CE, Wang JW, Juhn RJ. Total hip arthroplasty for primary septic arthritis of the hip in adults. Int Orthop 2008; 32(5): 573-80. Beaulé PE, Matta JM, Mast JW. Hip arthrodesis: current indications and techniques. J Am Acad Orthop Surg 2002; 10(4): 249-58. 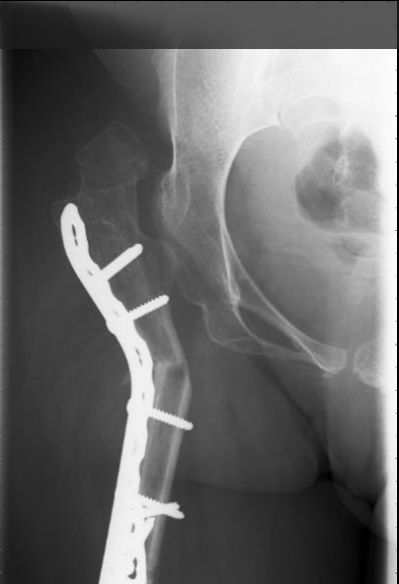 El-Mowafi H. Outcome of pelvic support osteotomy with the Ilizarov method in the treatment of the unstable hip joint. Acta Orthop Belg 2005; 71(6): 686-91. Kenaway M, Krettek C, Liodakis E, et al. Leg lengthening using intramedullary skeletal kinetic distractor: results of 57 consecutive applications. Injury 2011; 42(2): 150-5. 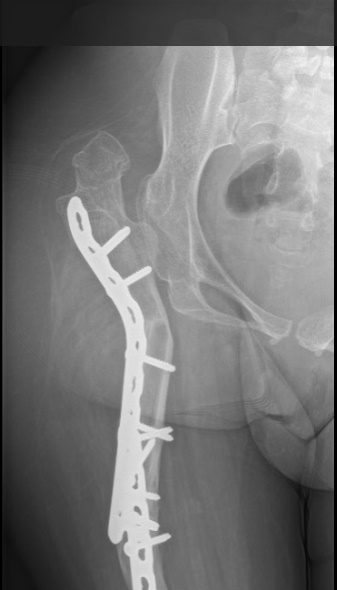 Singh S, Lahiri A, Iqbal M. The results of limb lengthening by callus distraction using an extending intramedullary nail (Fitbone) in non-traumatic disorders. J Bone Joint Surg Br 2006; 88(7): 938-42. García-Cimbrelo E, Curto de la Mano A, García-Rey E, Cordero J, Marti-Ciruelos R. The intramedullary elongation nail for femoral lengthening. J Bone Joint Surg Br 2002; 84(7): 971-7. Götz J, Schellman WD. Kontinuierliche Verlängerung des Femur beiintramedullärer Stabilisierung. Arch Orthop Unfallchir 1975; 82: 305-10.